Here are three types of stock trading strategies that work. You can use them to generate regular income from stock market trading. You can choose one of them and trade it exclusively as the only one and the best swing trading strategy. Or, you can combine all of them in your stock trading system and profit from different market situations. The description of every stock buying strategy below is specifically for swing and position traders. If you’re a day-trader, you have to modify or read more about the best day-trading strategies that work. Breakout stock market trading strategies can be very profitable. They offer extremely explosive potential during strong trend markets. It’s a very important condition for trading breakouts; use it preferably in a strong bullish market trend. The market is in a bullish trend. 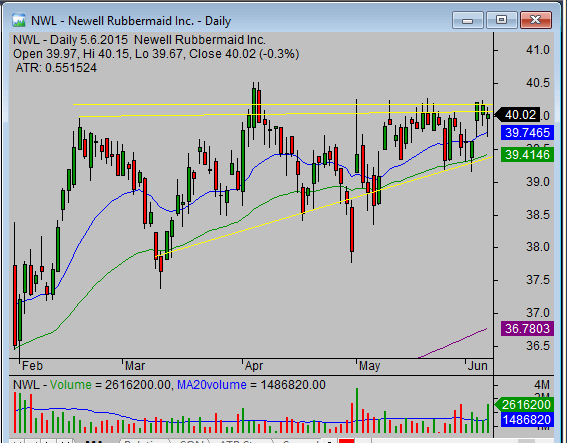 The stock is near its horizontal resistance. The resistance has formed for several weeks already. The stock moves in a tight range just under the resistance for several days. The volume slowly increases, but the price change is small. Check this example of a breakout swing trade strategy opportunity. All these conditions lead to the breakout that has explosive potential. The price moves rapidly up when the line of resistance breaks and sellers are on the retreat. Buyers are quickly rushing into this stock and continuously buying. This buying pressure pushes the price up quickly. The price advances quickly, so your trade profits quite soon. The failure rate is quite small during a strong bullish market trend. The stock price can reach your target area soon, so you can make money quickly. The trend can help and the trade can overrun your expected target. The trade will generate much larger than expected profit in this scenario. The price moves quickly and you should enter the trade quickly to have a good entry point for your trade. The risk reward ratio can become worse if you can’t enter this trade soon enough. TIP: Set your entry order well before the stock breaks out and use the market order to enter the trade in the best price. Bullish pullback stock trading strategies work well in a strong bullish trend market. But their advantage is that they’re also good for a not-so-trendy market. You can also trade with this swing trade strategy during neutral and even during bear markets. The stock made a strong advance in previous weeks. 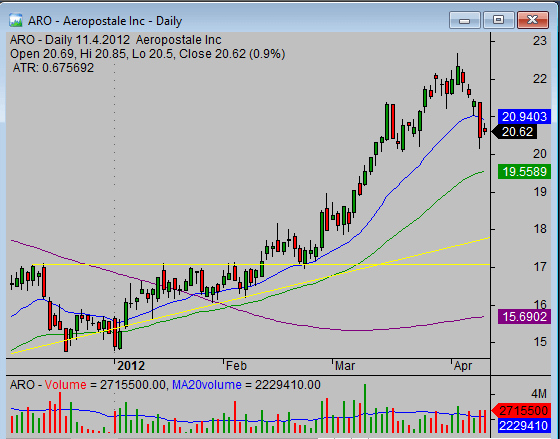 The stock pulled back a little bit but no farther than 50 percent of the previous strong move. 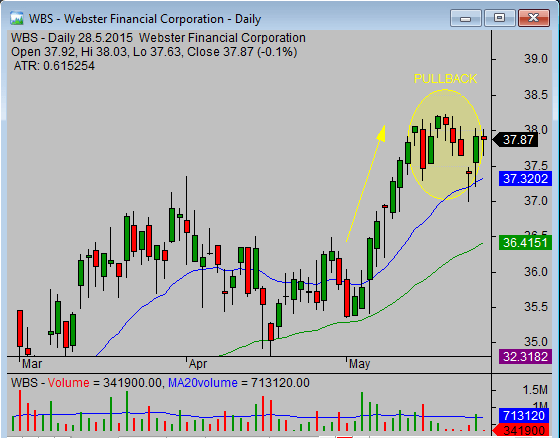 The volume during a pullback is smaller than during a strong move up. The stock shows a good relative strength to the general market. This stock buying strategy is less risky. It offers a better risk/reward ratio than breakout strategies for trading stocks. The bullish pullback strategy is useful in almost every market situation. You can trade it in a bull market but also in neutral or bearish stock market conditions. The stock price can rise also in bearish or neutral markets. The timing of the entry can be a little bit tricky. It can be hard to use this swing trade strategy in bearish markets and buy stock during a market downtrend. You can also base successful stock trading strategies on chart patterns. There are several good stock chart patterns that provide consistent returns for swing traders. These strategies for trading stocks have similar characteristics to breakout strategies. The market is in a bullish trend that supports trade direction. 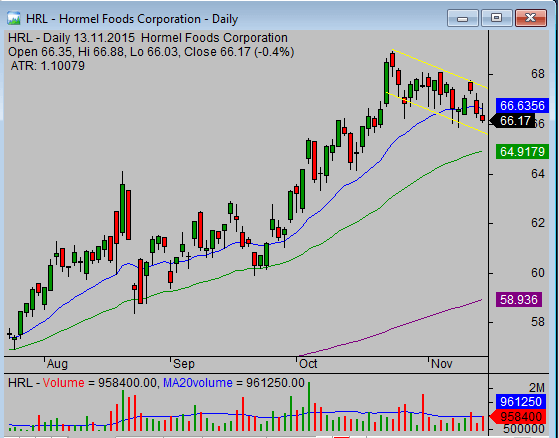 The stock price forms a bullish chart pattern. The stock price moves in a tight range as a pattern develops. The preferable patterns by many profitable stock traders are a bullish cup with handle chart pattern or continuous flags and pennants chart patterns. The breakout is often strong, and the price moves quickly in the expected direction, that is, the trade is quickly profitable. The failure rate is quite small during bullish market trend conditions. The price can surpass the expected target level. There are many different chart patterns for swing trading. They’re not very suitable for bearish market situations. The breakout from the pattern can be quick, and it complicates the trade entry. Study more about stock trading strategies that work on this site, or if you want to make more info, join my trading club and watch swing trade strategies in action. I publish detailed stock picks and trade setups for breakouts, pullbacks, or using chart patterns regularly.